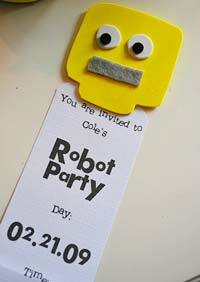 You can make cool homemade robot invitations for your Robot birthday party? They will definitely needs some very cool. One method is to make your own invitations on your computer. It is easy enough to find some robot clipart or free stock photos and make up a word document to print on your home printer. If you want something with a little more pizzazz then you might want to give these invitations a go. 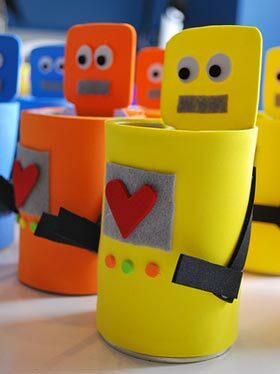 Larissa threw a robot themed birthday party for her son, and she really likes to think outside the box for party invites. She was drawn to the idea of using a can, but wanted to cover it...that is where the craft foam comes in. All the parts of the robot are made from foam. I free-handed all of the pieces. Measure and cut a strip of foam to cover the entire can. Cut out the different parts for the body. Two arms, a square a heart and some circles for buttons. Glue them on to the body piece. Glue the body foam strip to the can. For the invitation itself - meaure a rectangular strip that will fit without bending into the can. Open a Word document or similar on you computer and type the party details keeping them within the width and length required for the card. You should be able to fit several invites on the one sheet of paper/cardstock. Print and cut out the party details. You can round off the corners with a Carls corner punch if you like. Cut out a robots head from the craft foam. this should be a square shape approx the same width as the invitation with a tab at the bottom so that it can be glued to the top of the invitation. 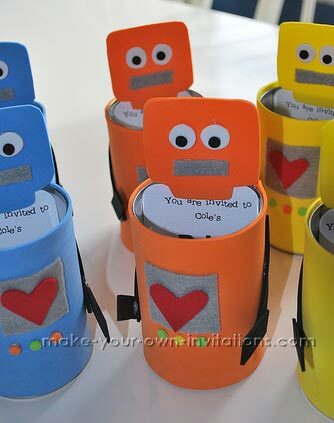 Slip the invitation into the robot can body and give to your guests.